Hemp seeds are rather oily and high in fat. One tablespoon contains 3 g to 4 g of fat. The majority of this is polyunsaturated fat — the good kind of fat — and according to Blue Shield of California, shelled hemp seeds contain both omega-3 and omega-6 fatty acids. However, all this fat can come at a price, and you may experience mild diarrhea when adding high-fat foods, including shelled hemp seeds, to your diet. If your digestive system is sensitive to change, start with small amounts of hemp seed — say, a teaspoon a day — and slowly work your way up to the recommended serving of 2 tbsp. 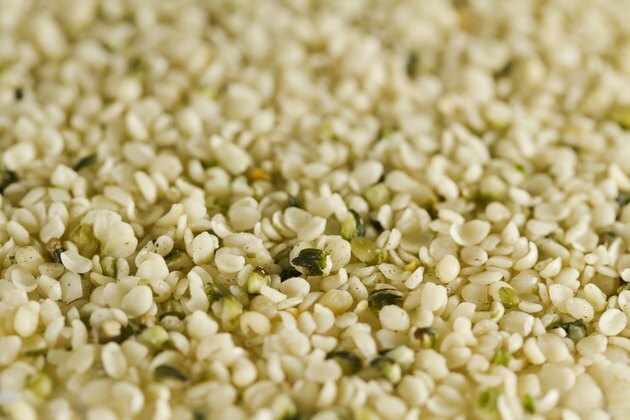 Eating shelled hemp seeds will not produce the same effects as smoking a joint of marijuana. According to David P. West Ph.D., a plant researcher who has studied hemp extensively, the compound in marijuana that produces its psychotropic effect, THC, is only produced in the flowers, buds and leaves of the cannabis plants, not the seeds. However, since the seeds come into contact with the rest of the plant, some residue may remain on the seeds after processing and shelled hemp seeds may contain extremely low levels of THC. The exact levels vary by brand, so if you are very sensitive to THC and happen to buy a brand with higher-than-average levels, you may experience euphoria or hallucination. It is also highly unlikely — although not impossible — to get a positive drug test result after consuming large amounts of shelled hemp seeds. Hemp and Marijuana: Myths &amp; Realities: David P. West, Ph.D.